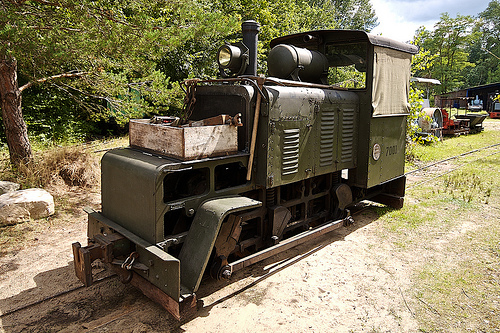 Looking around the web for unique prototype railways to model, these have caught my eye. I think many would make an interesting small layout. Bord na Mona is a vast Peat Bog in Ireland. Peat was Ireland’s only significant indigenous fuel. Large scale extraction meant less reliance on imports and the creation of a great many jobs at a time when poverty and unemployment were still rife in parts of Ireland. 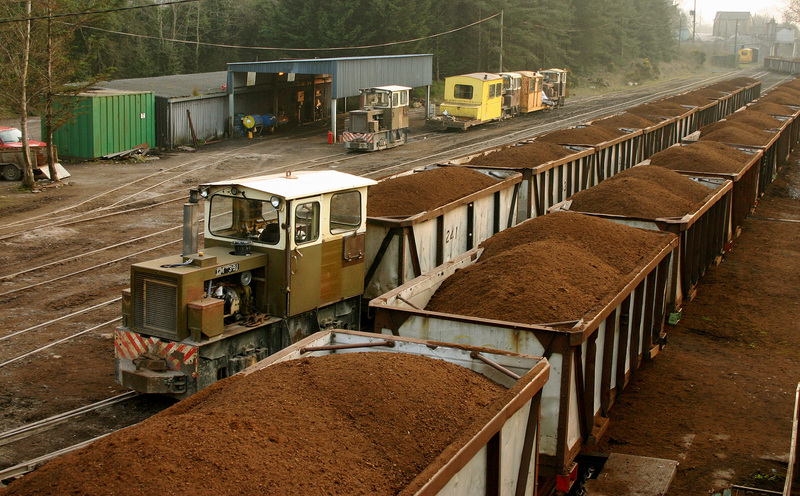 As BnM expanded, briquetting plants, power stations and horticultural bagging plants were established and linked to the bogs by a growing network of 3ft (and occasionally 2ft) gauge railways. Over the years, some areas have been worked out and the more remote bogs in Kerry, Donegal and Mayo abandoned. Older power stations and briquette factories have been closed and replaced by newer, bigger plants. 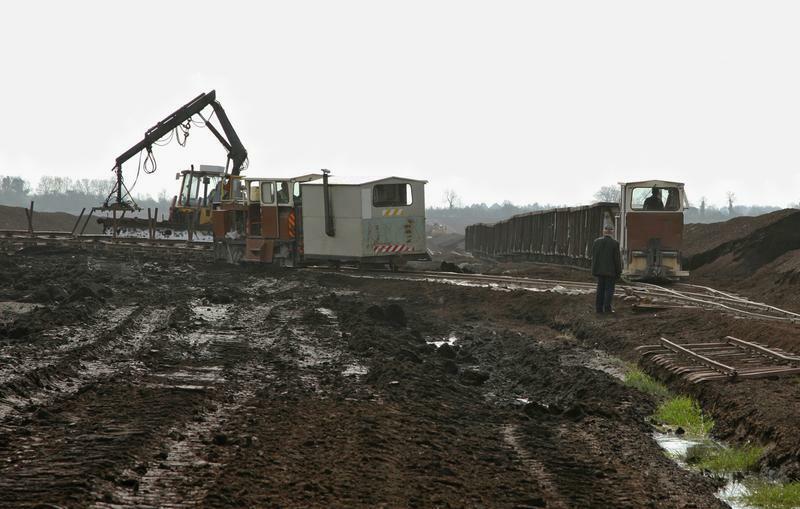 Developing a bog is a skilled and lengthy operation. Very detailed surveys are followed by a complex and carefully engineered drainage system, removal of all topsoil, bushes and trees. 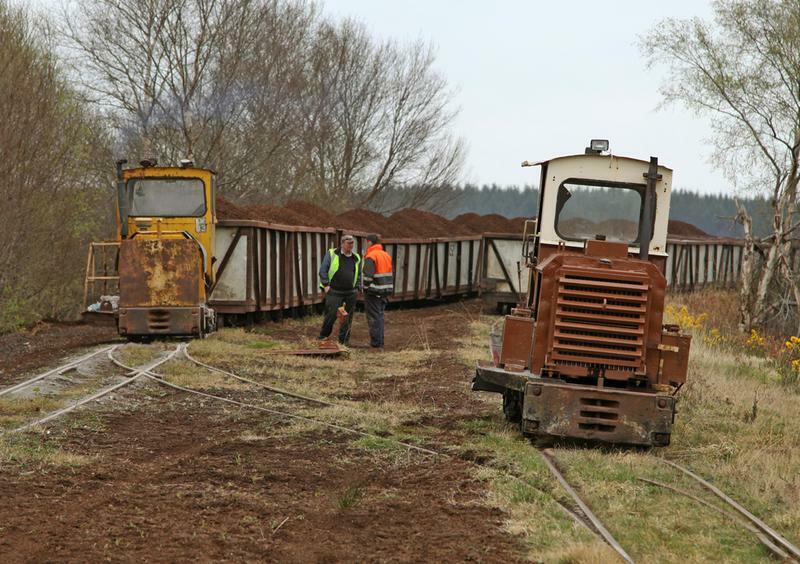 A new railway line is laid to connect to the nearest existing system or to a roadside wagon tippler. Peat from small bogs can be moved by road (e.g. Derrinboy Bog near Kilcormac) but railways remain much the most effective way of working large tonnages regardless of the weather. They don’t sink into the morass, they are very economical and they don’t clutter up the highways or irritate the local people. Most BnM bogs are worked on the ‘Peco’ principle as shown in the diagram below. 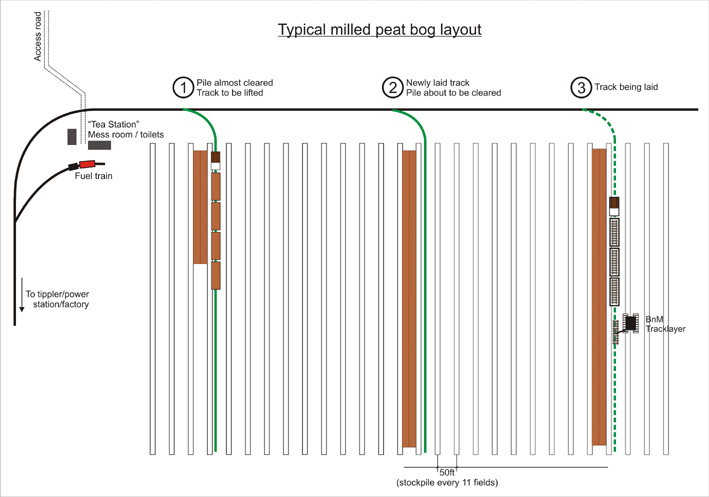 Each year about 100mm depth of peat is harvested and stored in piles running the length of the bog – often 1 mile or more – and about 170m apart. The landscapes include tall trees on the edge of the bogs and the crossing of several roads and canals providing many scenic interests. Below is the long abandoned route of the Ballinasloe Canal and, despite many decades of disuse, the lock gates and lockkeepers’ cottages can still be seen. 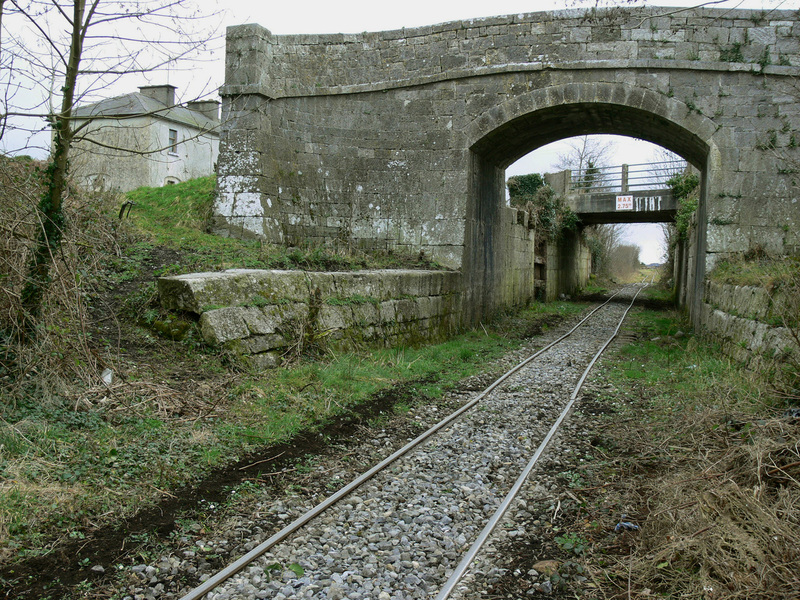 Bord na Mona found the canal bed made an excellent route for their Kylemore branch line. Not all track is as well maintained as above. Some can be treacherous. Why not combine your hobbies and have some beer with your railway. 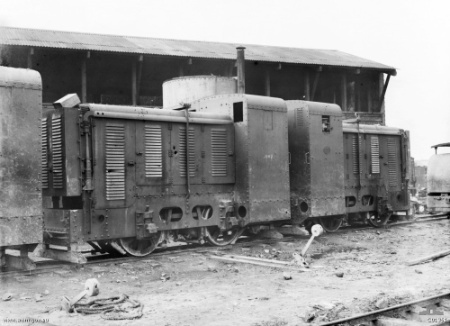 The Guinness plant had two railways, a narrow gauge and a broad gauge. The narrow gauge ranged throughout the massive Guinness facility as shown on the following map. In 1873 the Brewery purchased land lying between James’s Street and the River Liffey. This land provided access to the River Liffey (and from there to Dublin Port), and also to Kingsbridge Station (renamed Sean Heuston Station in 1966) – the main terminus of the Great Southern and Western Railway and link to the Irish rail network. This divided the Brewery in two creating an ‘upper’ level and a ‘lower’ level separated by James’s Street. Several departments were moved to the new ‘lower level’ including the Cooperage, washing and filling sheds. However, it became more and more difficult to move materials around the much larger site with horse-power alone. The Company’s solution was to construct a railway. The Brewery’s newly appointed Engineer-in-Chief, Samuel Geoghegan, oversaw its construction. In designing the railway, two difficulties had to be overcome. 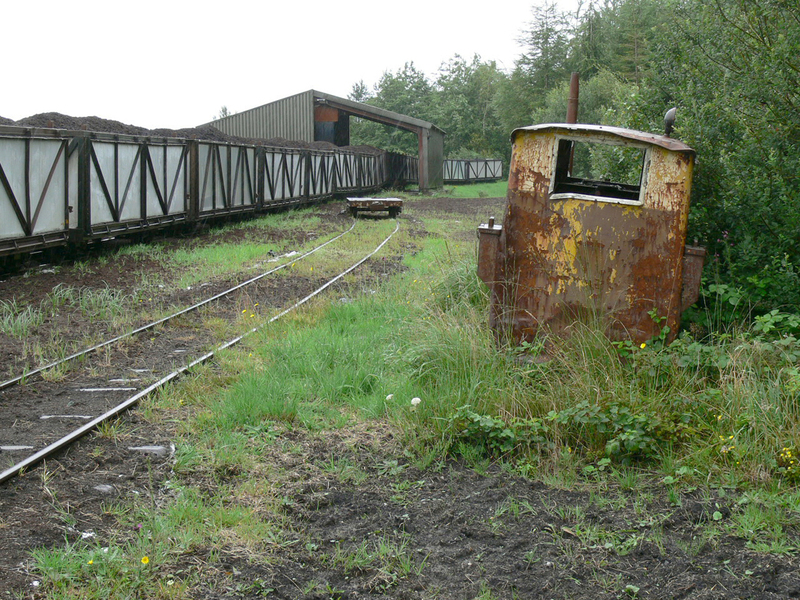 Firstly, the track needed to be narrow enough to navigate through the Brewery, but a connection was still needed to the broad gauge track in Kingsbridge. 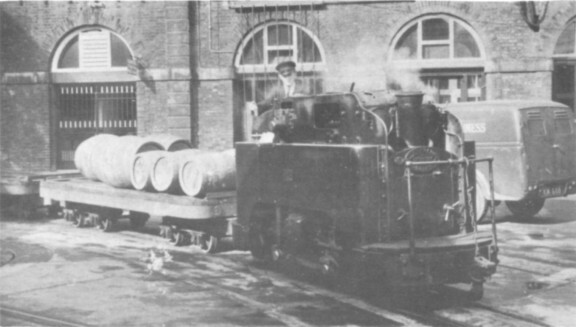 The solution was to lay two different types of track – a 22” narrow gauge system for working within the Brewery boundaries, and a 5ft 3in broad gauge system to link to Kingsbridge. A broad gauge tramway connection along St. John’s Road was authorized to Great Southern & Western Railway by an Act of Parliament in 1874 to serve the Brewery from Kingsbridge station. Secondly, there was the problem of how to link the track between the ‘upper’ and ‘lower’ levels – with a difference in height between them of 50 feet. This was initially overcome by using a hydraulic lift to lower the locomotives down to the lower level – this eventually proved too slow. In 1875, Samuel Geoghegan proposed that a tunnel be built to bring the locomotives from the upper to the lower level. A spiral rather than a straight tunnel was built, to cope with the difference in height. The tunnel, similar in design to tunnels through the Alps, turned 2.5 revolutions under St. James’s Street. The spiral tunnel had a radius of 61ft 3” and cost £3000. Locomotives were then used to haul malt-wagons, spent grains, casks, and even hops around the Brewery from one level to the other. 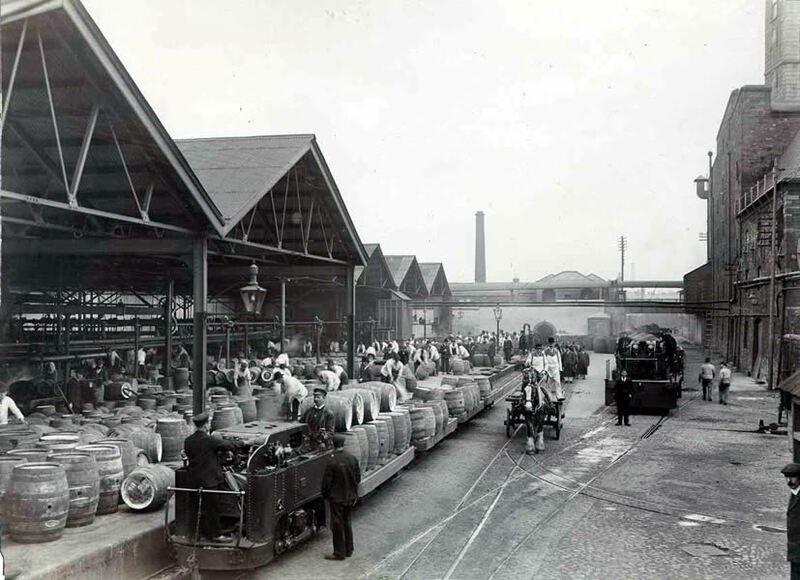 By the time the railway was complete in 1877, there was two miles of track within the Brewery site. WWI saw the use of trench warfare. 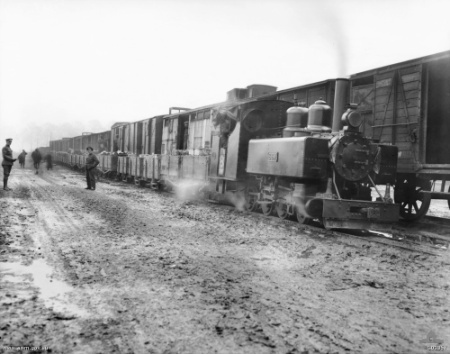 Railways came into use on both sides to bring food and the materials of war to the front lines. 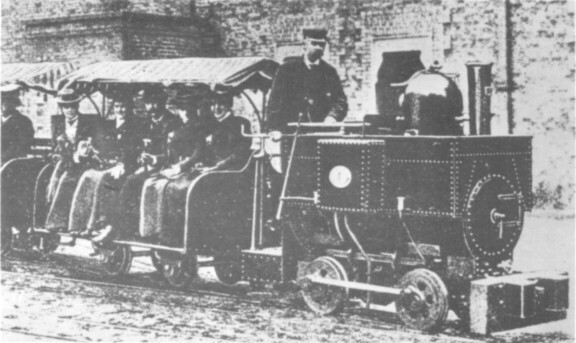 The use of gas mechanical locomotives had a great boost during this time. 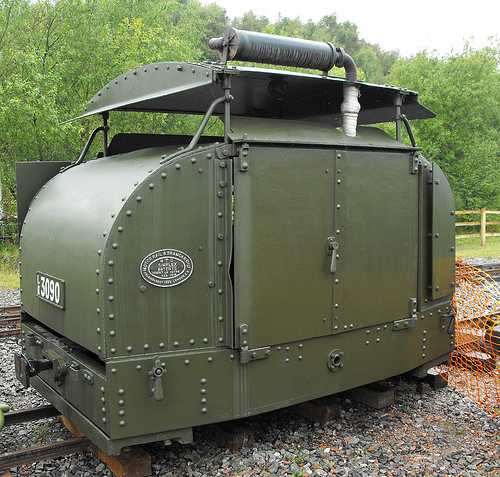 Since they gave off very little exhaust (compared to a belching steam locomotive) they became the preferred motive power near the front line. Many miles of light rail were laid. Many times these would be overrun during the ensuing battles and some rolling stock and the occasional locomotives would fall into enemy hands. The US locomotive producers did their share to provide where the European makers could not keep up with demand. 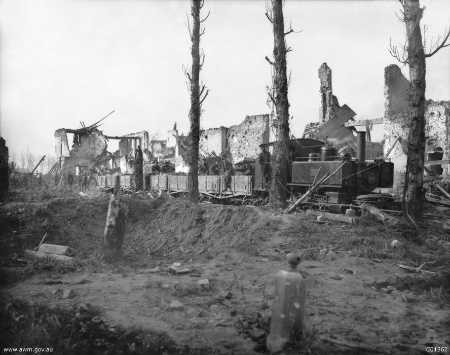 The war also saw the use of armored locomotives to protect the train crews. Most supplies were brought to a transfer area. 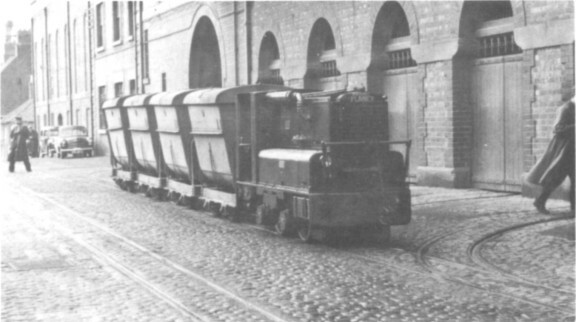 Here supplies were transferred to the narrow gauge trains for transport to the front. 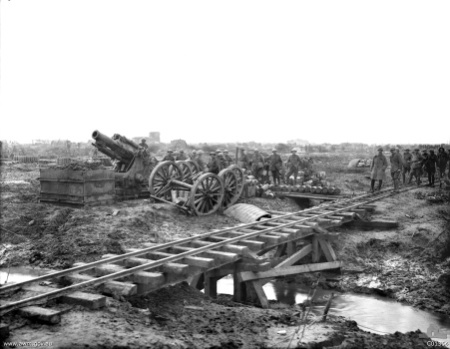 Film was still new during WWI but the camera still caught the railway doing it’s job at the front. Each of these could make interesting yet unique subjects for a small model railroad design. Got an idea for a small layout? Send it, I would be interested to see it!